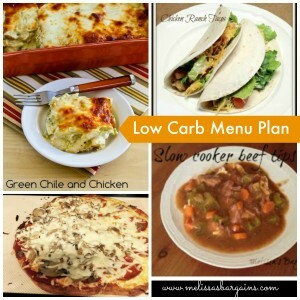 Menu Planning Monday: Easy Low Carb Recipe Ideas! We fell off the low carb wagon over the holidays, but we’re ready to get back on track!!! I have discovered that the key is to involve your kids in the menu planning and to choose some of their favorites. Here’s this week’s Low Carb Menu Plan for Families. 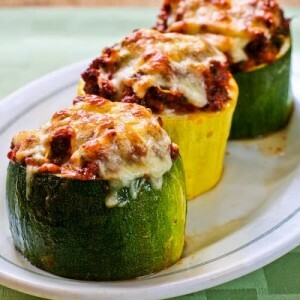 MONDAY: Mozzarella Stuffed Zucchini Cups – My son is NOT a veggie lover…at ALL! His main veggie consumption consists of carrot sticks dipped in ranch dip. When I made this for the first time a few weeks ago, he LOVED it. He actually raved about how delicious it was and how it was his favorite meal for days. I was in complete shock. If you haven’t tried out this one from Kalyn’s Kitchen yet, you’re missing out! For breakfast, we will also be trying out this Low Carb Ham & Cheese Breakfast casserole! TUESDAY: Chicken Fajitas – When my son was playing football, Tuesdays were our busiest nights and so they became “Taco Tuesdays” because that was easiest. 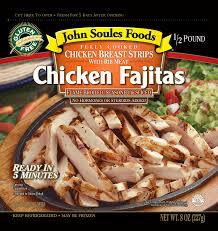 To make it even easier, I use these John Soules Chicken Fajita strips (I get mine at Sam’s Club, but you can get them at most grocery stores). The kids eat theirs with low carb tortillas. I like mine plain with some Herdez green salsa or some homemade guacamole if I have time to make it! WEDNESDAY: Low Carb Pepperoni Chicken Bake – One thing I’ve learned about any sort of diet in my house is that if I want to be successful, I need the ENTIRE family to do what I’m doing. I don’t have time to cook different meals for different people. That means I have to find recipes that my entire family will enjoy. This was another favorite! THURSDAY: Slow Cooker Creamy Beef – Instead of serving this one over pasta, I’ll be making cauliflower mashed potatoes with it! FRIDAY: Grilled sausage with sauerkraut – It’s the end of the week and my son has basketball practice, so it’s a double whammy and I knew we would need something quick and easy! SATURDAY: Fathead Pizza – I honestly couldn’t believe how easy this was to make or how incredibly yummy it is! One of the things my kids LOVE is pizza. This has been an absolute LIFESAVER for us! 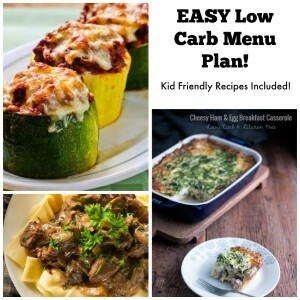 Kid Friendly Low Carb Meal Plans! We survived our first four weeks on a low carb menu although I did let my kids cheat a little bit this weekend and have some Halloween candy. We’re back on track today and all of the Halloween candy is disappearing! I have discovered that the key is to involve your kids in the menu planning and to choose some of their favorites. Here’s this week’s Low Carb Menu Plan for Families. 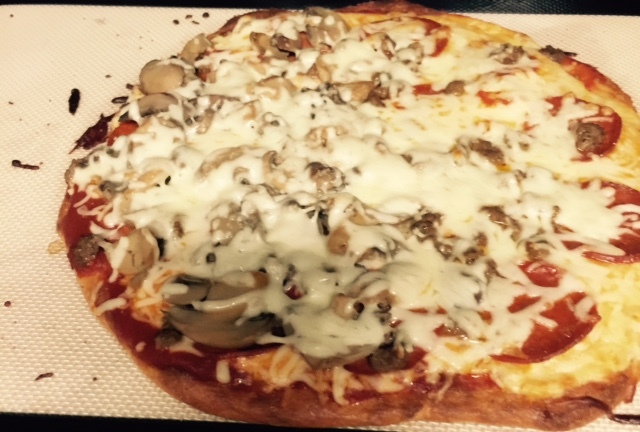 SUNDAY: Low Carb Pizza – One of the things my kids LOVE is pizza. I discovered a low carb pizza dough recipe that has been an absolute LIFESAVER for us! I tried a different low carb pizza dough recipe a few weeks ago and while we enjoyed it, I feel like the almond flour in this recipe really made it seem more dough like. This has become our Sunday night tradition! MONDAY: Green Chile and Chicken Mock Enchilada Casserole – My family LOVES enchiladas and I wasn’t sure how we were going to survive without them when we started our low carb diet. This recipe from Kalyn’s Kitchen was one of the first that we tried and it was a huge hit! I am experimenting to switch it up a bit this week, and I will keep you posted! TUESDAY: Taco Tuesday – Tuesday nights are busy with football practice and swimming, so they’ve become “Taco Tuesday” I cook pre seasoned fajitas or ground beef and we have tacos on low carb tortillas. Depending on my carb count for the day, sometimes I have taco salad instead! 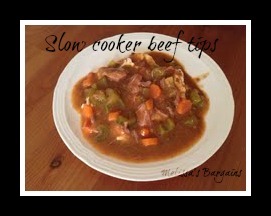 WEDNESDAY: Slow Cooker Beef Tips – I’m modifying my slow cooker beef tips recipe and serving it with cauliflower ‘mashed potatoes. YUMMY! THURSDAY: Sausage and sauerkraut – Keeping it easy tonight since it’s another busy night! 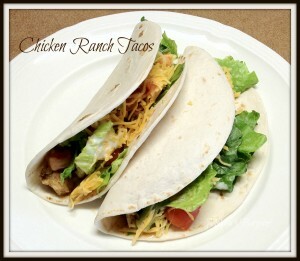 SATURDAY: Chicken Taco Salad – Tonight I’m going to use my Slow Cooker Chicken Ranch Tacos recipe to make chicken taco salad! 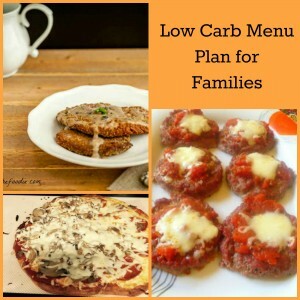 Low Carb Menu Plan for Families! We survived our first three weeks on a low carb menu and I feel like we are really getting the hang of this! My success story for the past week was when my kids asked if they would be able to trade in their Halloween candy for an Atkins treat! I have discovered that the key is to involve your kids in the menu planning and to choose some of their favorites. Here’s this week’s Low Carb Menu Plan for Families. SUNDAY: Low Carb Pizza – One of the things my kids LOVE is pizza. I discovered a low carb pizza dough recipe that has been an absolute LIFESAVER for us! I tried a different low carb pizza dough recipe a few weeks ago and while we enjoyed it, I feel like the almond flour in this recipe really made it seem more dough like. 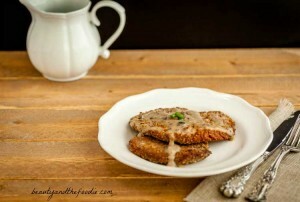 MONDAY: Paleo and Low Carb Southern Chicken Fried Steak – So I TOTALLY found a recipe for chicken fried steak that’s low carb thanks to Beauty and the Foodie. I totally cannot wait to try it and it’s only 3 net carbs! I’ll be making some cauliflower mashed potatoes to go with it! TUESDAY: Taco Tuesday – It’s Taco Tuesday, and it’s also a super busy night with football and swim practices. We make it easy by buying pre-cooked fajita meat and low carb tortillas! 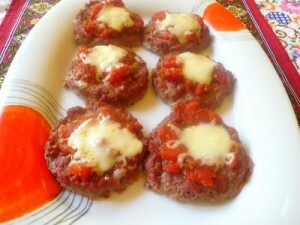 WEDNESDAY: Marinara Meatloaf Patties – Since we’ve been doing low carb I have probably been most disappointed in meatball and meatloaf recipes. They seem excessively greasy because there are no “fillers” which apparently help to cut the grease. I saw this meatloaf recipe from Splendid Low Carbing by Jennifer Eloff and decided to check it out. I’ll keep you posted. THURSDAY: Grilled sausage and sauerkraut – Thursday is another busy night for us, so we’re keeping it simple! FRIDAY: Buffalo Chicken Dip – My daughter is having a Halloween party and one of the things we’ll be serving is my mother in law’s buffalo chicken dip recipe which is low carb – yay! I’ll share the recipe soon! 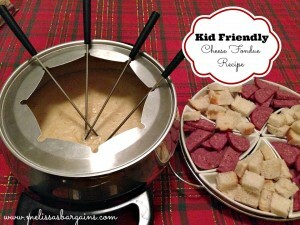 SATURDAY: Fondue – It’s Halloween, and our tradition is to have fondue. I’m hoping to figure out how to substitute regular flour when making the roux to pull it off as low carb! 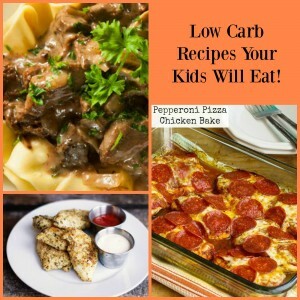 Low Carb Recipes Your Kids will eat! We survived our first two weeks on a low carb menu. I have discovered that the key is to involve your kids in the menu planning and to choose some of their favorites. For the most part, the kids have not complained much! I even fooled them with cauliflower “mashed potatoes.” They didn’t even realize they weren’t potatoes and before he found out what they were, my son said they were his favorite part of the meal! Here’s this week’s round up of Low Carb Recipes Your Kids Will Eat. SUNDAY: Low Carb Pepperoni Pizza Chicken Bake – I am LOVING the recipes I’m finding on Kalyn’s Kitchen. She’s got stuff that’s totally kid friendly and right in sync with what my family loves! This recipe has been added to our family’s favorites list! 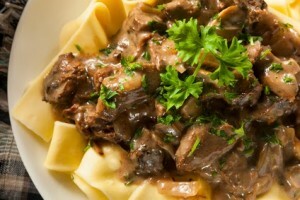 MONDAY: Slow Cooker Creamy Beef – The actual title of this recipe from A Year of Slow Cooking is Creamy Beef over Noodles, but since we are low carb, we will be skipping the noodles and instead I’ll be making some Garlic Mashed Cauliflower to double as mashed potatoes. TUESDAY: Taco Tuesday! With football and swimming, I like to keep Tuesday nights simple. We’re having tacos on low carb tortillas (I will have taco salad for mine) and I will make some homemade guacamole! 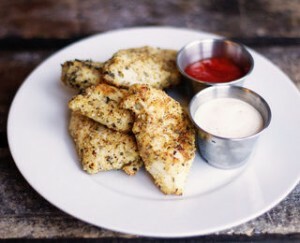 WEDNESDAY: Parmesan Chicken Strips – This Parmesan Chicken Strips recipe I found sounds pretty yummy. I can’t wait to test it out! 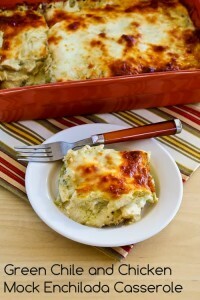 THURSDAY: Enchilada bake – We liked this Mock Green Enchilada Casserole during our first week so much that I’m going to experiment tonight and try to create a similar recipe using red enchilada sauce. Stay tuned for the recipe and review! 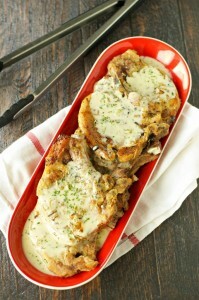 FRIDAY: Crock Pot Pork Chops with Creamy Herb Sauce – I’m looking for recipes to change things up so we don’t get burned out, and this recipe from Crockpot Gourmet looks delicious! SATURDAY: Crock Pot Turkey Chili – It’s our trunk or treat at church and we’re having a potluck, too! I’ll be taking a crock pot turkey chili recipe! 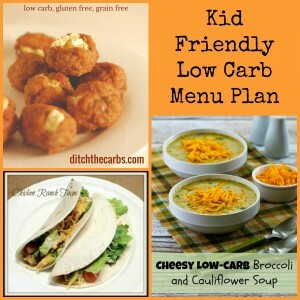 Menu Plan Monday: kid friendly low carb recipes! We survived our first week on a low carb menu. I have discovered that the key is to involve your kids in the menu planning and to choose some of their favorites. When I asked my kids how they thought our first week went, they said they thought it went great! When I asked them if there were any recipes they actually hated, they said no! This is a HUGE bonus considering that my son is a picky eater! 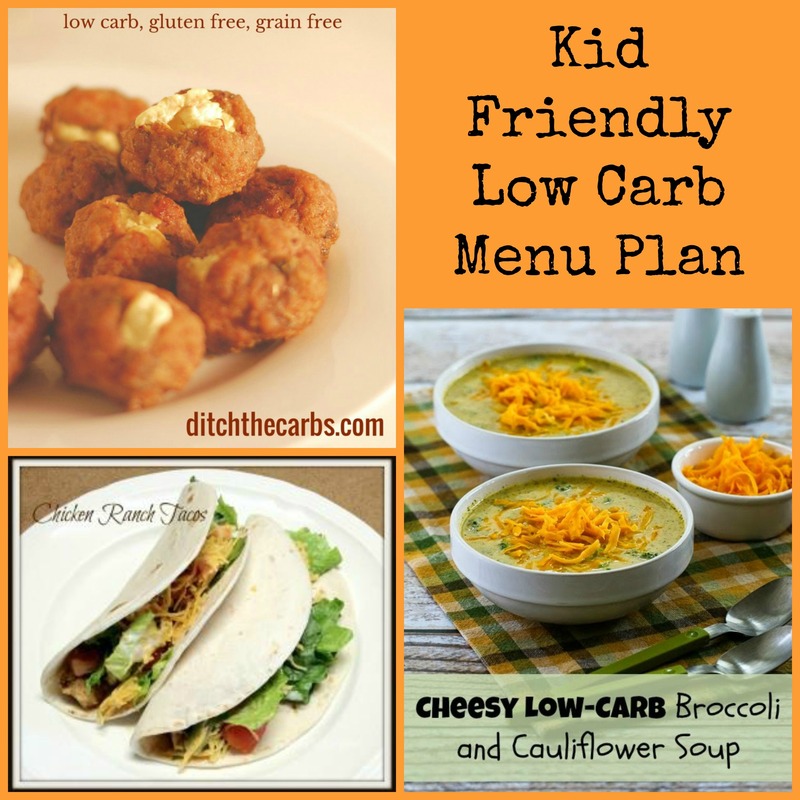 Here’s this week’s round up of Kid Friendly Low Carb Recipes. SUNDAY: Crock Pot Roast – This was a super easy roast recipe that I will have for you soon and I even tried my hand at making low carb mashed cauliflower. 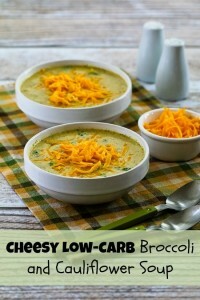 MONDAY: Cheesy Low Carb Broccoli and Cauliflower Soup – Broccoli cheese soup is a favorite and I was excited to find this recipe on Kalyn’s Kitchen! I can’t wait to try it out. We’ll be making some Low Carb Oopsie bread to go with it. This morning, we’re trying out Low Carb Cream Cheese pancakes for breakfast, too! TUESDAY: Fajitas with homemade guacamole – It’s a football and swimming night, so we need a quick fix meal. I buy the pre seasoned fajita meat and cook it on my Lodge Cast Iron Grill pan! I bought low carb tortillas last week, but we actually loved eating the fajitas with the veggies, guacamole, and sour cream and no tortillas! 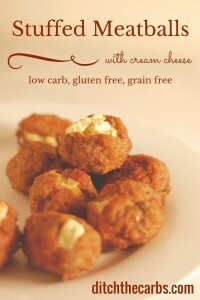 WEDNESDAY: Low Carb Cream Cheese Stuffed Meatballs – How can you go wrong with meatballs stuffed with cream cheese? This recipe from Ditch the Carbs looks amazing! THURSDAY: Sauerkraut & sausage – it’s another busy night with football and swimming, so we’ll be having sauerkraut and beef kielbasa sausage. 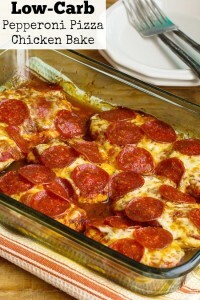 FRIDAY: Low Carb Pepperoni Pizza Chicken Bake – I am LOVING the recipes I’m finding on Kalyn’s Kitchen. She’s got stuff that’s totally kid friendly and right in sync with what my family loves! In honor of the end of a week, I’m also going to try out this recipe for flourless brownies!